Since I last wrote, much has happen to this Old Soul. 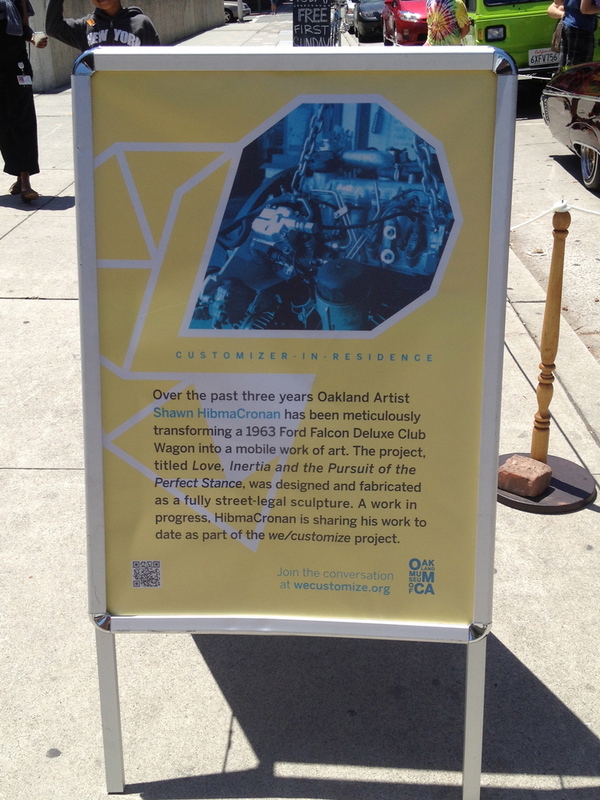 I was asked to show the Econoline at the Oakland Museum of California for the finale of their We/Customize show. 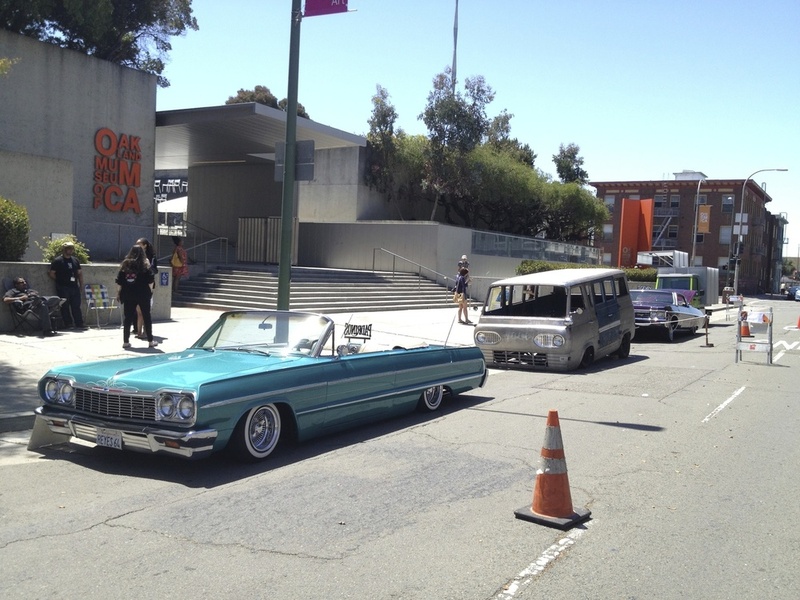 It was a pleasure to show my work alongside a couple of extraordinary and traditional lowriders from the Bay Area's Padrinos Car Club. Such BEAUTIFUL cars and great guys who loved the Econoline; shaking my hand when they learned that I did the work myself. The event was a great opportunity to invite the friends, fans, and Kickstarters to come see a preview of the work in progress. It was great to hear feedback and field questions. I was completely surprised and honored by how far some fans traveled just to speak with me about the project and get a look at the vehicle in person. Another exciting thing to report; I was contacted by ABC7 News to do an interview for a segment about how artists are using the internet to find success. I spoke about the project and my experience with Kickstarter. Click here to watch. Below are the details of what's been done to the vehicle since I last wrote. Forgive the deep automotive particulars, if it's not your cup of tea. In this project no corners have been cut, and nothing will be glossed-over. As in all my work, attention to detail and the craft are critical. I've been delving into every small challenge; addressing each like a work of art. In the last update I was so thrilled to report that we acquired an ideal engine and transmission combination: a VW TDI motor connected via an adaptor to a good old Toyota transmission. Since then I've carefully positioned this unlikely match into the vehcile's frame in a way that brings a smile to my face every time I see it. Ample space and visibility around the components will make later adjustments and repair a pleasure. Shifting the motor back and down from the original motor position will help to even out the weight while bringing the vehicle's center of gravity substantially closer to the earth. This will make for much improved handling when the vehicle is rolling at ride height. 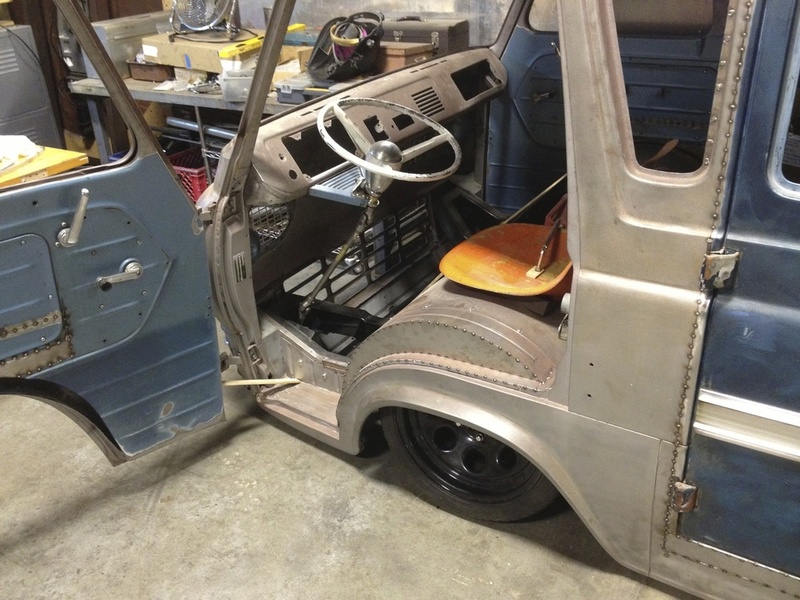 The Econoline is a forward-controlled vehicle, meaning the driver sits directly over the front wheels. This makes the design of the front wheel tubs critical, not only do they protect the vehicle from debris, they also need to serve as a sturdy surface to attach driver and passenger seats. Complicating this further is the extremely low stance of the vehicle, which requires the wheels to tuck up into the vehicle much higher then the original wheel tubs would allow; interfering with the doors and window glass. To figure this out was a bear of a job but, when all was said and done, the result is completely functional and far more aesthetically pleasing than I'd hoped. The next logical place to focus was on the design of the "cockpit" (Thanks Russ!). So I began to determine the exact placement of the various functional components that make for an enjoyable driving experience. I made a steering wheel mount that is tilt-able and installed a beautiful extra-wide powering steering unit custom made for the project by Flaming River Industries. 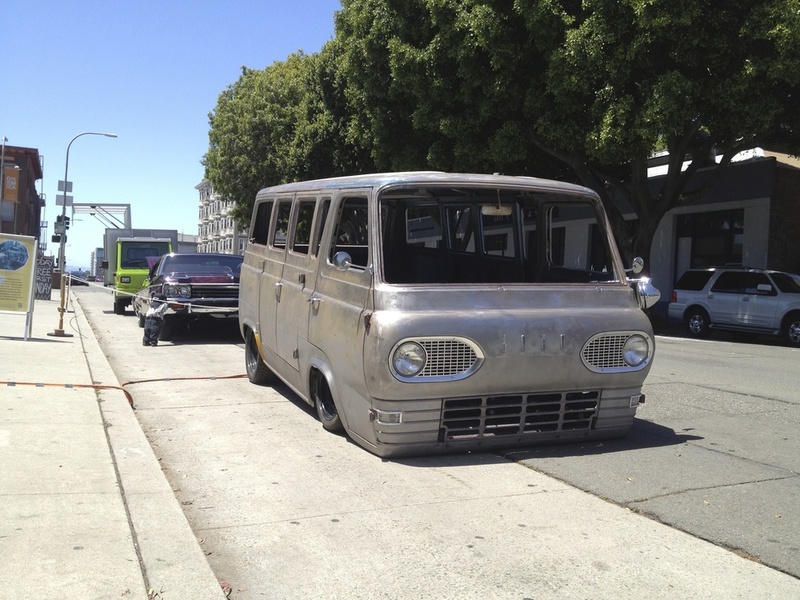 I was then faced with another issue that arises with the Econoline being a forward control vehicle; the indirect path that the steering linkage must travel to connect to the front wheels. After much trial and error I designed solution to overcome this obstacle. I built a right-angle steering box that mounts cleanly inside the front frame section right below the foot well. The added benefit of this design is that it enables me to offset the original steering shaft forward and left 5". I can then center my brake and gas pedals while providing much more foot-room to get in and out of the vehicle. Under the car, this steering offset provides far more room for the radiator and intercooler. Once the steering was fully assembled I was pleasantly surprised by how tight the steering felt. When turning the steering wheel there is zero slop and immediate wheel response. I then reinforced the dash with a horizontal bar and made it removable to make installing the gauges, computer, air switches, and the pedal assembly easier in the future. All 8 of the doors (including the newly spliced in ones) were remounted and trued. Each door, proudly wearing 50 years of life, needed plenty of loving mallet blows and tweaks to ensure proper latching, door gaps, and body lines. 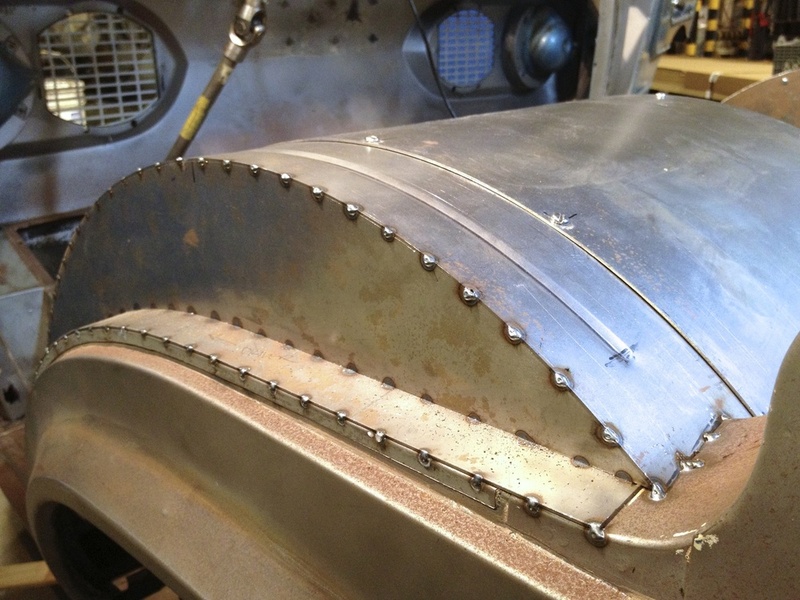 Many of the trim pieces were reformed to bring them back to life. Reinstalling the trim on the body will be a final step. A wonderful new air valve unit from Accuair was installed providing far superior control of the air suspension system. 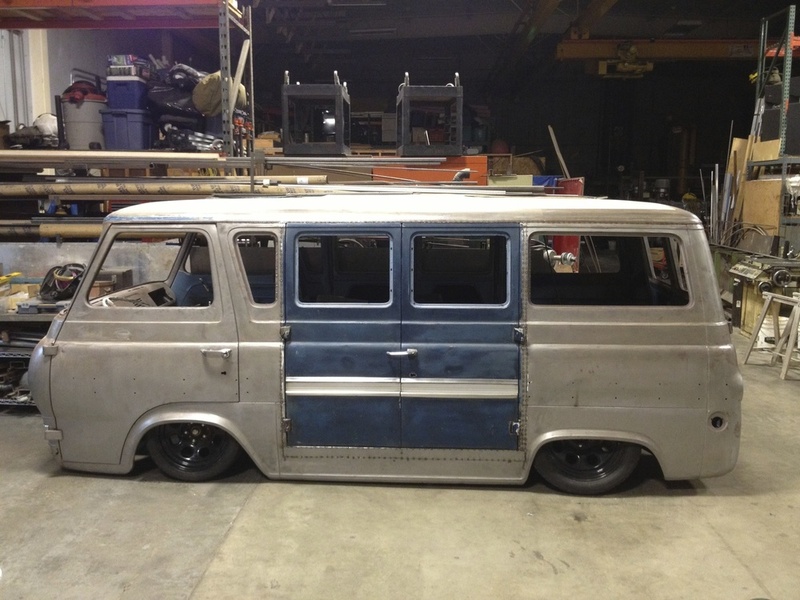 The best part is that the unit is so well made that it gives the vehicle an entirely new stunt to go along with it's repertoire, true to lowrider tradition; 3 wheel motion. If that means nothing to you, then let me break it down; It gives the vehicle the ability to lift a wheel nearly a foot off the ground, balancing on one front wheel and one opposite rear wheel. The best part is that the frame I built that runs throughout the vehicle doesn't flex a bit while under this increased strain. Awesome, and such fun to watch. Sometimes you just need to act on an opportunity when the time is right. I am heading to Brooklyn for a few months. For an artist NYC is a great place to make work and immerse in the art community. The Econoline and all its parts are carefully buttoned-up, and I've left the studio keys in the hands of a dear friend to watch over. It's interesting that so far being outside of my usual studio routine has provided valuable perspective and fresh ideas about the piece; along with time to research and sketch out the final details that will bring this project to its full potential. To all of you who are anxiously awaiting the unveiling of the piece, fear not; I have great things planned for early in the new year. Again, a huge thank you to all for the ongoing support and enthusiasm.